Just checked this one out today .. the latest from Eric Clapton. Guitar work is real tasty, Clapton is Clapton, he can do no wrong .. but this is more a vocal album. If you like to hear Clapton singing, this has him trying out every style. Tulsa Rock, Reggae, Country, Jazz standards .. and he takes on Gary Moore’s “Still Got The Blues” in a very laid back way. Every tune on this album is real laid back. Simon Climie is involved in the production, and he did an earlier thing for Clapton that I didn’t like the sound of that much either. On the heels of a sold-out Crossroads Guitar Festival and the announcement of a major world tour, Eric Clapton announced the release of his 21st studio album and his first album since 2010. 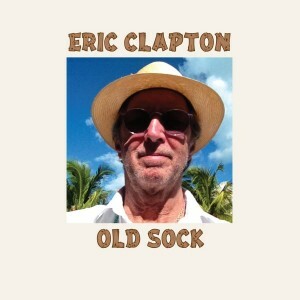 The album, Old Sock produced by Eric Clapton, Doyle Bramhall II, Justin Stanley and Simon Climie, features two original songs “Every Little Thing” and “Gotta Get Over. ” Old Sock is released on Clapton s Bushbranch label, distributed through a collaboration with Surfdog Records in the USA and Canada. The album is a collection of some of Clapton s favorite songs spanning from his childhood to present day that highlights his vast appreciation and knowledge of music. From Leadbelly to J.J. Cale; Peter Tosh to George Gershwin; Hank Snow to Gary Moore and Taj Mahal, this record is a celebration of so many who have inspired Clapton s rich musical life. Clapton has always had a remarkable ability to recognize great songs and a gift for knowing how to uniquely interpret them, as he does on Old Sock. The album explores romantic standards of the 30’s, reggae, soul, rock, and includes a stand out playful collaboration with Paul McCartney, to create an experience that is quintessential Clapton. Clapton assembled a band for the recordings consisting of longtime collaborators Steve Gadd (drums), Willie Weeks (bass) and Chris Stainton (keyboards) along with some surprise guest additions. JJ Cale joins the song “Angel” for backing vocals and guitar, Chaka Khan joins as backing vocalist for “Get On Over, ” Steve Winwood on the Hammond B3 Organ on “Still Got The Blues, ” Paul McCartney on bass/vocals on “All of Me, ” Jim Keltner on drums for “Our Love is Here To Stay.